Herrold, Catherine E. 2018. A Conceptual Model of Foundations’ Leadership Capacity in Times of Change: Lessons From Egypt. Nonprofit and Voluntary Sector Quarterly, Vol. 47, Issue. 2, p. 286. Aristotle, , Nicomachean Ethics, Book 2, Section 9. Beerbohm, Eric. Forthcoming. “The Free Provider Problem: Private Provision of Public Responsibilities.” In Philanthropy in Democratic Societies, ed. Reich, Rob, Bernholz, Lucy, and Cordelli, Chiara. Chicago: University of Chicago Press. Commission on Industrial Relations. 1912. “Final Report and Testimony Submitted to Congress by the Commission on Industrial Relations created by the Act of August 23, 1912amprdquosemicolon: 7916–17. Dowie, Mark. 2002. American Foundations. Cambridge, MA: MIT Press. LaMarche, Gara. 2014. “Democracy and the Donor Class.” Democracy: A Journal of Ideas 34: 48–59. Posner, Richard. 2006. 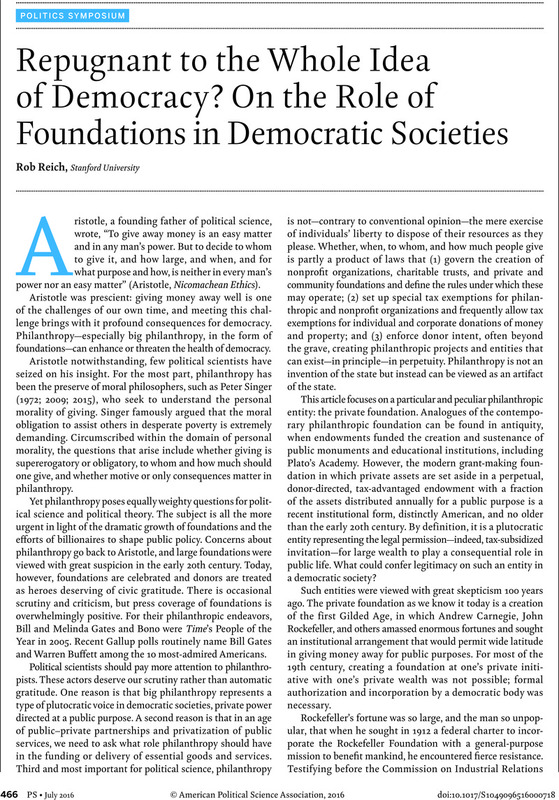 “Charitable Foundations: Posner’s Comment.” Becker-Posner Blog, December 31. Available at www.becker-posner-blog.com/2006/12/index.html (accessed December 1, 2015). Reich, Rob. 2013. “Philanthropy and Caring for the Needs of Strangers.” Social Research 80 (2): 517–38. Singer, Peter. 1972. “Famine, Affluence, and Morality.” Philosophy and Public Affairs 1 (3): 229–43. Singer, Peter. 2009. The Life You Can Save. New York: Random House. Singer, Peter. 2015. The Most Good You Can Do: How Effective Altruism Is Changing Ideas about Living Ethically. New Haven, CT: Yale University Press. Thompson, Dennis. 2010. “Representing Future Generations: Political Presentism and Democratic Trusteeship.” Critical Review of International and Political Philosophy 13 (1): 17–37. Walsh, Frank P. 1915. “Perilous Philanthropy.” The Independent 83: 262–4.